Dr. Parast received her Ph.D. in Cell Biology (2000) and her M.D. in Medicine (2002) from the University of Virginia, Charlottesville, VA. During that time, she held the prestigious Medical Scien­tist Training Program fellowship. Dr. Parast then completed a six month postdoctoral research fellowship and residency training in anatomic pathology at Emory University, Atlanta Georgia, from January 1, 2002 through June 2005. In July 2005, Dr. Parast moved to Brig­ham and Women’s Hospital in affiliation with Harvard Medical School in Boston. There, she completed additional clinical training in the area of Gynecologic and Perinatal Pathology, and later combined subspecialty sign-out with laboratory research, initially as a fellow and later as an instructor at Harvard Medical School. Since her move to UC San Diego in 2008, she has developed a strong translational research program in trophoblast stem cell biology and placental development. The main focus of her lab is on the identification and characterization of human trophoblast stem cells. This work started with a publication during her fellowship on the expression pattern of p63, an epithelial stem cell marker, in the normal and diseased placenta. 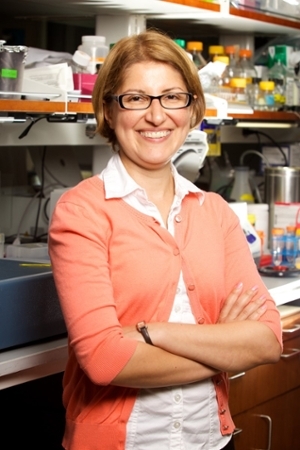 Later, through a New Faculty grant from the California Institute for Regenerative Medicine (CIRM), she extended this work to human pluripotent stem cells (hPSCs), and showed that trophoblast differentiation of these cells is dependent on p63. She has now characterized p63 further, using human trophoblast cell lines and primary human cytotrophoblast (CTB) and found that it plays a major role in maintenance of the undifferentiated CTB stem cell state. Most recently, her group has developed a reproducible protocol by which hPSCs can be differentiated into p63/CDX2 double-positive CTB stem-like cells. Using this protocol, they have shown that hPSC-derived CTB behave similarly to primary CTB, during both normal development and disease. The current work in the lab is focused on characterizing the heterogeneous CTB population in the early human placenta, in order to identify potential multi-potent stem/progenitor cell populations, and compare these cell populations to those CTB stem-like cells derived from hPSCs. The long-term goals are to establish trophoblast stem cell lines from early gestation human placentas, and to use human pluripotent stem cells to model trophoblast defects associated with pregnancy disorders such as preeclampsia and intrauterine growth restriction.